2016 was a brutal year. And in its final days, it stole the life of one of my dearest friends. John’s death was tragic, sudden, and wholly unexpected. I first met John almost 29 years ago, in April of 1988, probably on the first day of my new job at Mercer. He was the kind of person you would notice right away. Three things always stood out: (1) his looks (young, tall, handsome, and always impeccably dressed) (2) his laugh (raucous and infectious), and (3) that mouth (loud and profane). About a year into the job, when I tried to play match-maker between a single young woman, who worked as my paralegal, and John (who, as previously noted, was drop-dead gorgeous), she politely informed me that John was gay. The fact that I was so astonished shows how naïve I was at the time, and how much I had yet to learn. I had yet to experience the John Canova Tutorial on Life & Style. I worked closely with the group that John was part of, and as time went by and the number in the group diminished, I found myself working more and more with John. I began to see that, under that brash, flamboyant, irreverent exterior, was one of the most genuine persons I’ve ever known. John gradually crept into and occupied a place in my heart as I slowly and unexpectedly found a generous, caring and loyal friend. In our large, competitive work environment, there were always competing agendas and shifting alliances, and I was forced to always watch my back. John was one of the few (maybe the only) colleague who I never doubted had mine. I encountered a very rough patch the first year back on the job after giving birth to my son. I was tired, distracted, and trying to find my work-life equilibrium. John was a teammate of mine on two of my largest clients, and he went out of his way to help me, in a variety of ways – whether cutting me slack on deadlines, pitching in where I needed assistance, or even sticking up for me when others in the office complained about my new part-time schedule. When one of my colleagues repeatedly grumbled that I “wasn’t pulling my load,” I heard (after the fact) that John paid a special visit and flatly told that person to “f*@k off.” I was mortified and delighted. Another time, we flew to Nashville to do a compliance review on a 401(k) plan. We ate chicken-fried foodstuff at the Cracker Barrel (the first and only time I’ve been) and laughed at the Big-Hair ladies, we walked around the Opryland Hotel, and then got horribly lost on the way to our hotel in rural Tennessee. We found ourselves on back country roads, and John remarked that he was expecting men in white robes with burning crosses to appear from behind the trees. Which launched us into hysterics for no good reason. We stopped at a 7-Eleven to ask directions and John re-enacted his conversation with the “snaggle-tooth meth addict” clerk for me. Oh, he was so inappropriate, and all I could do was laugh! Then there was the time that John and I were on our way to a meeting at Cal State University headquarters in Long Beach and we missed our turnoff and kept going right over a very long bridge. Even though we were late for our client meeting, we laughed uncontrollably all the way over the bridge and back. Many days, in the office, at around 4:00, a bunch of us would gather in my office, to laugh and gossip, and basically blow off steam from our stressful day. When John was there, he and I would invariably start down some path of discussion (again, usually something wholly inappropriate) that would result in side-splitting fits of laughter, with tears streaming down both of our faces. There are only a handful of people in my lifetime that have consistently made me laugh that hard, and John was the best. Apart from all the fun, there was a serious, sensitive side to John that I grew to admire. We talked about almost everything in our lives with each other and I valued his opinion because I knew he was always honest in his feedback. Likewise, he trusted me with his struggles, and we discussed everything from his challenges as a gay man to his heartbreak over his mother’s decline due to Alzheimer’s disease. My long friendship with John opened my eyes and informed me, and gave me new perspectives on numerous issues, and for that I am indebted to him. After 25 years on the job (all of them with John) I took early retirement from Mercer in 2013. I wondered if my work friendships would survive the transition to retirement. I found several lasted a few months, but only a very few endured as lasting friendships. John’s friendship was probably the strongest. He continued to call me regularly (his favorite pet name for me was “Treasure,” along with “Bettina” and “Lamb”), and we enjoyed seeing each other for lunch and museum dates. Once, when my son came home from college and needed a new suit, John met us at the Macy’s in Sherman Oaks and we shopped for a sharp-looking suit. 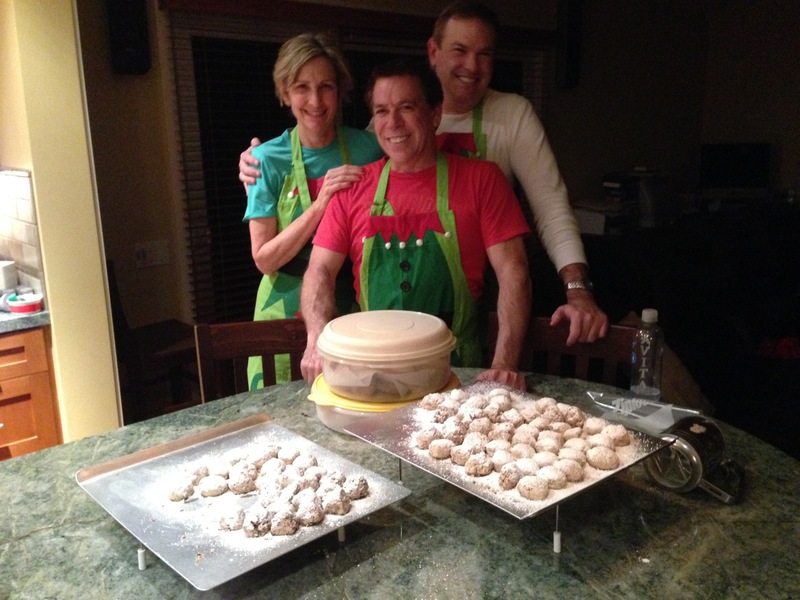 Every Christmas, we made holiday cookies together at my house. And on December 17, 2016, my husband and I had dinner with John and Andy (John’s partner) to celebrate the holiday season. When we hugged and said good night, and he called me Treasure, I had no idea that would be our last time. For me, a bright light has gone out, forever. Someone who has been in my corner, in my heart, for almost half my life, has left. There will never ever be another John, and I will always cherish the memories of a sweet and beautiful friend. Today we received our March-April 2014 edition of Shipmate, the magazine published by the Alumni Association of the US Naval Academy. 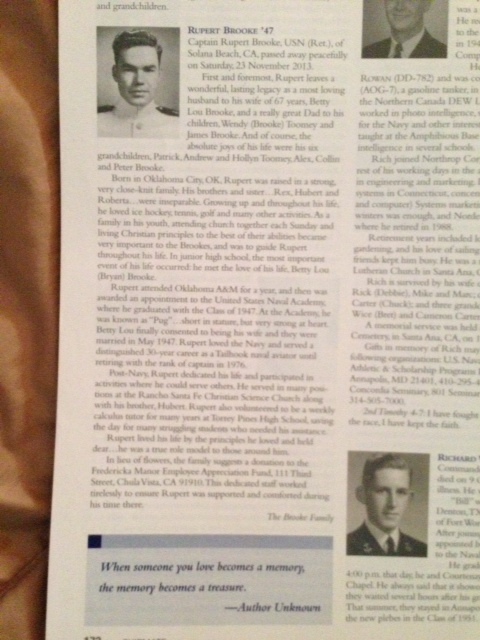 My husband is a 1967 graduate and my late father Bob was also an alumnus, graduating with the great class of 1947. Dad passed away on Veterans Day in 2005. I still really miss him. Alas, the first thing I turn to is the Last Call section, which features obituaries by class year. I check both the 1967 and 1947 sections, dreading the sight of a familiar name amongst these pages. Once I get through Last Call, then I feel comfortable reading other news and articles. My heart sank when I read that Rupert Brooke had died. I felt that old familiar punched-in-the-gut feeling. Again. He was a dear friend and long-time tennis partner of my Dad’s. He and Dad had a standing weekly tennis date in San Diego (where they both retired) for years. Dad would invariably come back from one of his tennis dates with another uproarious story about “Good Ole Rupe” (as he always called him). I only met Capt. Brooke (as I called him) a few times, but he was such a central character in my Dad’s life that he became one of those people who felt like an old friend in mine. I knew that Capt. Brooke had been a Tailhook naval aviator and he regaled my father (who as a Navy dentist was a bit of wimp himself but loved vicarious flying) with stories of carrier landings and other thrilling daredevil aviator adventures. 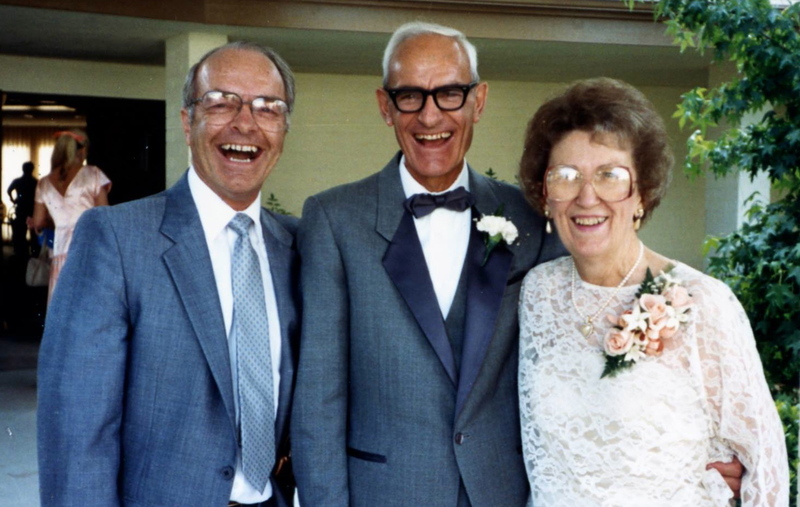 At one point, shortly before my father’s cancer diagnosis, he told me that ‘Ole Rupe’ was very sick – that he had been diagnosed with an aggressive form of skin cancer and was not expected to survive. I don’t recall my Dad ever being sadder. As fate would have it, Capt. Brooke survived that bout of cancer while my father did not. In fact, Capt. Brooke missed my father’s funeral due to his own hospitalization. Once Capt. Brooke recovered, I took my Mom to have lunch with the Brookes, and he wrote me a series of letters with stories about my Dad and offering encouragement to my son (who was pursuing an appointment to USNA himself). When my mother passed away three years later, Capt. Brooke was again quick to offer condolences and support, and in the years since we exchanged Christmas cards and I received occasional notes of encouragement. I haven’t received anything from Capt. Brooke in the past couple years and in fact one letter I wrote to him last summer went unanswered so I feared a turn for the worse. And now ‘Good Ole Rupe’ is gone. And I am heartbroken. Capt. Brooke was one of the few remaining threads to my Dad. The more time elapsed and the more friends and associates gone, the more “final” my Dad’s death feels. News like Capt. Brooke’s death stirs up sorrow for my Dad anew and begins another cycle of grief. I turned to the previous Shipmate edition and found the obituary for Capt. Brooke (which I had apparently missed). I read that Capt. Brooke was born and raised in Oklahoma City and that he met his wife of 67 years when they were both in junior high school. He had two kids and six grandchildren and was a weekly calculus tutor for struggling students at a nearby high school. And I know that he was an inspiration to me and a beloved friend to my Dad. You will be missed, Capt. Brooke. Rest in peace. Say hello to my Dad for me. He will be delighted to have his favorite tennis partner back. Our recent trip to Phoenix included a profound and inspirational encounter that truly blessed me. It came unexpectedly in the form of a two-hour conversation on the patio at a public golf course. It was what I like to call a “God Sighting.” I asked for and received permission to write about it in my blog. Kim was my stepson David’s girlfriend. I don’t recall exactly when we first met, but I know I liked her immediately. She was very young, tall and beautiful; but she had an endearing sweetness and genuineness. I thought she was a good match for David. He was a handful, and Kim was adventurous and athletic enough to keep up, and with a mind of her own to hold him in check. They had their ups and downs, but she was kind and loyal, and generally a good influence on him. Over time, I really grew to love her. When David died in a snowboarding accident in 2002, Kim was devastated. In the immediate aftermath, we spent significant time together grieving. I was heartbroken over losing David and all the other aspects of his life that I would miss – his friends, his future wife, his future children, his future life. Although I didn’t fully understand it at the time, I was also sorry to lose Kim as part of my life. 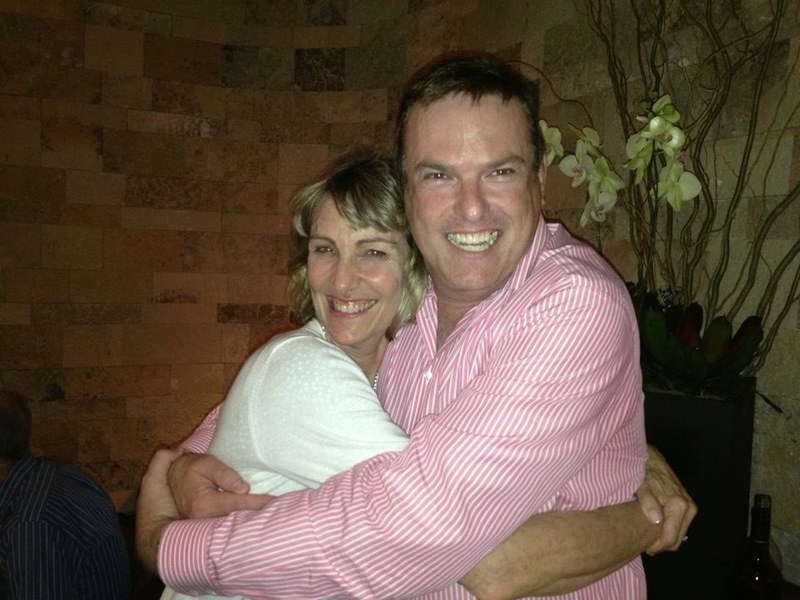 As fate would have it, Kim married VJ, who was one of David’s good friends. We kept in touch sporadically over the years and through these brief exchanges I learned Kim and VJ moved to the Phoenix area and had two little girls; that she had struggled mightily with David’s death for years; and that she and VJ had encountered significant issues in their marriage. Her most recent message to me, however, was upbeat, and conveyed that through hard work on their marriage, and God’s help, they had emerged stronger and more deeply in love. We also agreed to meet when my husband and I were in Scottsdale for our Spring Training trip. Thinking about Kim reminded me of the ripple effect of a death, and how so many lives are changed forever. There are untold people or ways we may never even be aware of. With David’s death, I have been mindful of various family members struggling in different ways. And Kim was another victim of his death. The last time we saw her in person, the year David died, she was a frightened, confused and shattered young woman. I wasn’t sure what to expect now. Would it be awkward? Would she still be broken after all these years? My expectation was that our role in this visit might be chiefly support and comfort. On our first full day in Scottsdale, she met us alone at the golf course. As we walked off the course my heart leapt for joy as she rushed toward us with a huge smile. She was a more mature, but still beautiful, version of the girl I remembered. As the three of us sat on the patio, we caught up on the here and now, reminisced about the past, and about David, and we laughed and cried. It was not at all awkward: rather there was an easy familiarity. She was keenly interested in hearing about our son (David’s half-brother) and about us. Then she told us about her life in the years since David’s death. What emerged was the story of a strong, courageous and confident woman who had walked through the valley of death and by faith and determination had found healing, transformation and redemption in her life and in the life of her family. What stuck me most was her fierce love for her two young daughters, who obviously fuel her drive. Her eyes light up when she talks about her girls. She spoke in great detail about each of them and their special talents and abilities. She is a mother who listens to and notices the individual gifts of each child and finds ways to nurture them. As Kim spoke of her mother, Patricia, I remembered that Kim shared a similarly strong bond with her own mother. Patricia is now a source of support for Kim with the girls. In fact, Patricia just left with Kim’s oldest daughter on a special grandma-granddaughter trip to Paris. Kim has surrounded herself and her girls with love and support. Kim has not lost her sweetness and genuineness. She spoke openly and lovingly about her husband, the trials they have been through, and the life they have built together. I can only imagine how complicated and difficult it must have been to work through the issues of having a “ghost” in the marriage. But they fought for their marriage, and through prayer and effort, they have strengthened their bond. The day before we left Phoenix, we met up briefly with Kim at the Dodger’s Stadium in Phoenix. 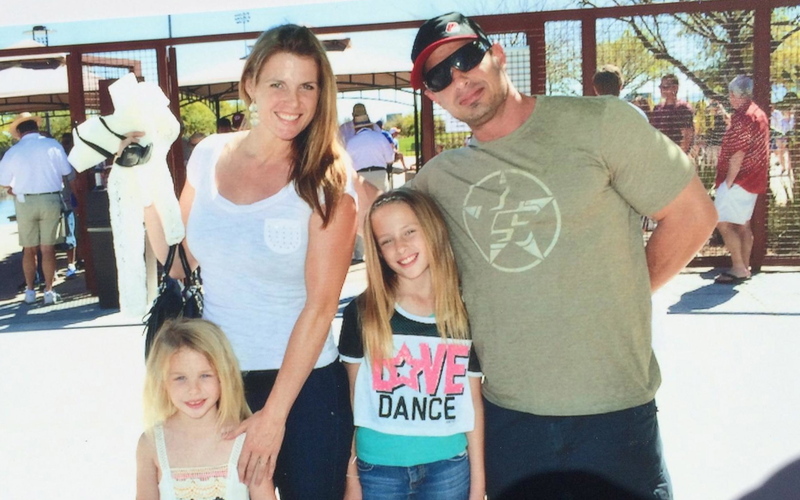 She was at the game with VJ, her two girls and her parents. After hearing so much about all of them, I was delighted to meet them. As we hugged good-bye, it was the hug of loved ones. Although she is not family in the strict sense, we walked away knowing we will always be important in each other’s lives. I felt witness to two miracles that day – the first being the divine makeover of Kim’s family and the second being the restoration of Kim in ours. I thought, too, of how appropriate that this took place in Phoenix, named for the mythological creature that rose from the ashes to fly and soar. I am exceedingly proud of Kim and who she has become. I am inspired by her example of commitment. I give praise to God for hearing and answering her prayers. And I am grateful to have her back in my life. “Unresolved loss is cumulative and cumulatively negative.” I was recently struck by these words (from The Grief Recovery Handbook by John James and Russell Friedman). Right smack in the middle of my current manic phase of retirement, as I was busy throwing myself into the pursuit of new and exciting opportunities for my upcoming retirement years, I experienced a profound and wholly unexpected episode of grieving for past losses. It started a week ago on Friday, which was my stepson David’s birthday. 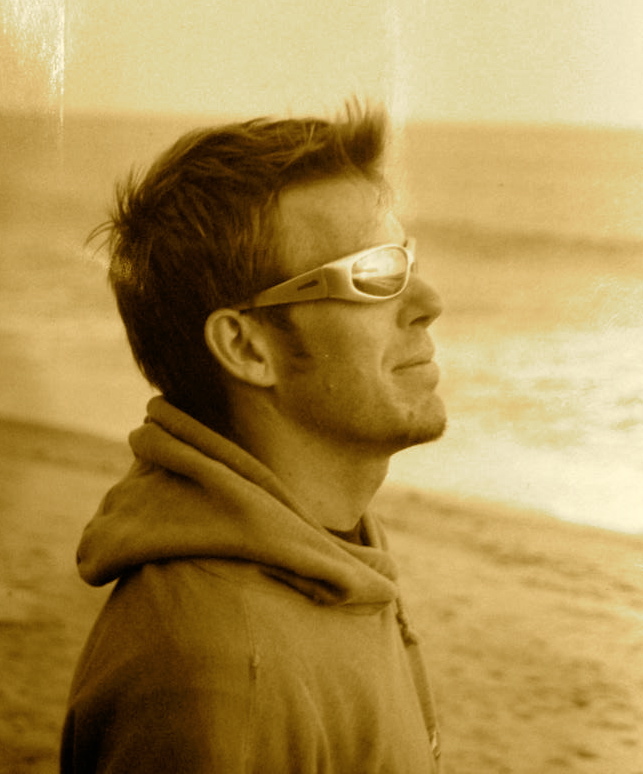 He would have been 43 years old, but he was killed in a snowboarding accident in 2002. I typically don’t make any public mention of him or the circumstances each year on his birthday; rather, my husband, son and I quietly and prayerfully remember him. This year, my niece Tamra (David’s cousin), posted a photo on Facebook of David (when he was around 7 or 8) with Tamra and Megan (Tamra’s sister), at their grandparents’ house celebrating his birthday. Along with the photo was a touching sentiment about David’s birthday and how much he is missed in our family. This simple act prompted an organic electronic outpouring of remembrances on Facebook, with Megan, Tamra and Kim (David’s girlfriend at the time of his death) my son and I all participating (each of us from a different city) with postings of more photos and memories. It was a remarkable, deeply comforting and completely unanticipated community experience. The next day I was scheduled to travel to San Diego by myself for the weekend to visit friends from high school. I was looking forward to a fun ‘girls’ weekend, but I was still feeling raw from Friday and the long drive gave me time to reflect. I thought about David and all he meant to me. I was young (27) when I met my husband, who at the time was a single dad with custody of 14-year-old David (who played adorable match-maker during our courtship). My subsequent marriage was therefore a package deal, and I became full-time stepmom (at 29) to a headstrong and spirited teenage son. My relationship with David was one of the most challenging, but ultimately most rewarding, in my life. With him, I learned to be a mom. I learned about friendship and love. He could be a harsh critic, but also my most loyal steadfast supporter. As he grew older, he became a cherished confidante. When my son was born, I wasn’t sure how David would react to a half-brother, but David loved him immediately and fervently. David couldn’t get enough of him and had great plans for the two of them. They would’ve gotten into such wonderful trouble together! When David died at age 31, he was just coming into his own. I was looking forward with great anticipation to seeing him settle down, get married, have kids (grandkids!!!!!!!!). People, trying to be helpful, said things like, “Feel better, he’s in a better place” or “Time heals all wounds” and there’s partial truth in those statements. My Christian faith reassures me of his eternal life. But the dead don’t grieve; rather, grief belongs to the ones left behind. And David’s death still hurts. My loss is a future without him. My son, who is now 20, was 8 when David died. 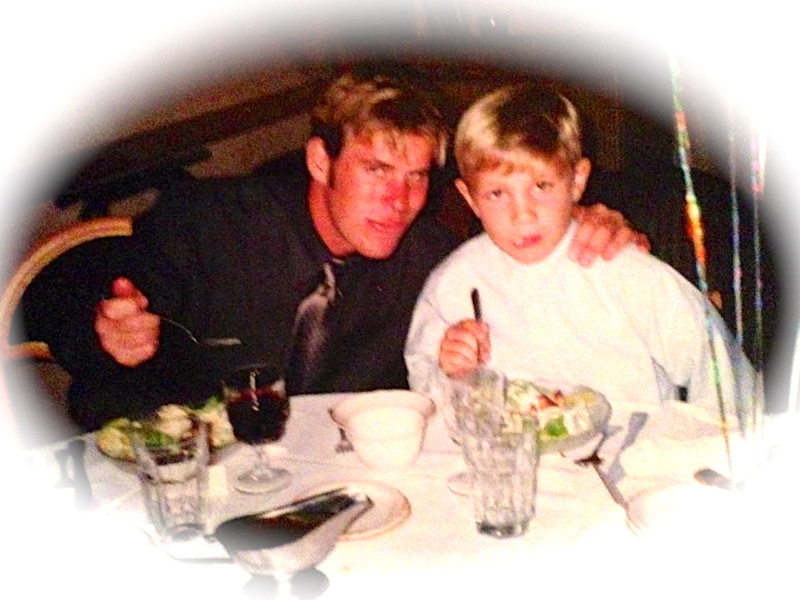 I’m sad that my son grew up without his big brother – a big brother that would have been his biggest fan and so proud of his accomplishments. For years after David died, I still looked for him to show up at my son’s sporting events, and when I saw someone that looked like David, my heart would jump and then plummet at the realization that it wasn’t him. When the phone rang or the front door opened, I had a similar reaction. At my son’s Induction Day at the Naval Academy, in the midst of intense pride, I felt intense sadness that neither David nor my parents were there. I’m sad that I don’t have grandkids to help David raise. He would’ve made an awesome dad. The closer I got to San Diego, I also became melancholy about my parents. I was starting to get annoyed at myself for all the drama, but it was rather involuntary and there wasn’t much I could do. San Diego holds many memories, as it was there I spent my teenage years and where my parents remained until shortly before they both passed away. For most of my adult life, my parents’ house (later condo) in San Diego was my safe haven – where I would return to visit, to rest, to drop off my son for babysitting. My parents always gave me the space I needed, no questions asked. If I showed up and spent four days sleeping upstairs, that was fine with them. If I asked them to take us to Sea World, the Zoo and the Wild Animal Park (all in the same weekend), they happily complied. When they both died, I lost my safe haven. Fortunately, in the midst of my gloom, my visit to San Diego was exactly what I needed. I am blessed to have close enduring friendships from my high school days that provide me with space to be vulnerable. First I had brunch with my friend Kelly, whom I met in sixth grade, and who is one of the kindest, most compassionate people I know. The rest of the weekend I spent with my friend Celeste, who has overcome great personal challenges with a grace and aplomb that I have long admired. She is completely nonjudgmental and I’ve always felt comfortable talking to her about anything. She opened up her house to me and gave me that safe haven I was missing. Being with friends who literally and figuratively embraced me for the weekend, who gave me room to talk and rest, who know me well enough to both challenge and support me, was life sustaining. As I left San Diego for the drive home, I reflected again on loss. I thought about how, as we get older, the losses begin to accumulate. Throughout our lives we experience broken relationships, job loss, divorce, death, empty nest, and, most recently for me, retirement, which signals the end of a career. I thought about how important it is to pause to recognize losses, to honor them and the attendant grief. One of the benefits to me of this blog is that writing helps me to identify and process. More important is the experience of being truly heard by others. I realized how important the past three days had been, and how God placed key people and events in my path to help guide and comfort me through some unexpected but necessary grief. I will never be completely “over” grieving my past losses and I will have new wounds to face. As I head into retirement, I need to be aware of any grief over leaving my career and that phase of my life. But as last weekend reminded me, when I was slapped in the face with unforeseen and powerful grief, I have less to fear from sorrow and loss when I take the time to honor and recognize it, surrounded with people who know me and care for me. Sometimes in my quest to charge forward, I need to stop and look backward. And rest for a spell. Time does NOT heal all wounds.